Anthony Knockaert will be looking to celebrate another goal like in the last meeting at the Vitality in the FA Cup third round back in January. Image courtesy of Robin Jones from AFC Bournemouth on Getty Images. Brighton will be hoping to get three vital points in their bid to avoid relegation. 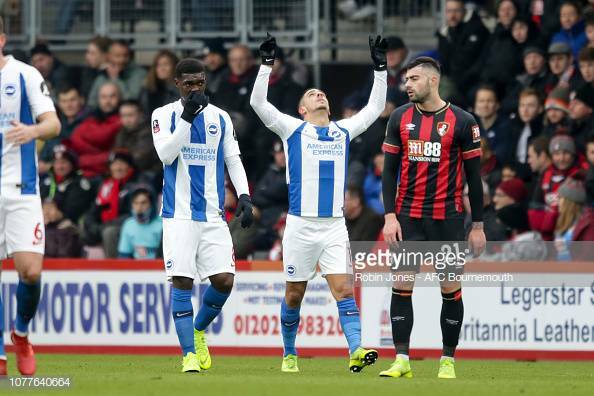 Brighton are looking to get a vital three points in their bid to avoid relegation when they entertain AFC Bournemouth at The Amex. The Seagulls go into the game off the back of a brilliant performance against Manchester City, in the FA Cup Semi-Final in which they deserved not to lose. Bournemouth head into the game off the back off a 3-1 loss at home to Burnley. Brighton will be unlikely to be without Pascal Gross, who is back in training after a long absence with a hamstring injury. However, Solly March is in contention for a return to the squad after recovering from a calf injury he picked up in the defeat to Chelsea. This means that Brighton are likely to start with exactly the same side that started the FA Cup Semi-Final defeat to City, which is; Ryan, Montoya, Duffy, Dunk, Bernardo, Stephens, Propper, Bissouma, Jahanbakhsh, Murray and Knockaert. Bournemouth have a lot of players missing with injuries and key one at that. Their Injury list includes Steve Cook (groin), Lewis Cook (knee), Charlie Daniels (knee), Simon Francis (knee), Diego Rico (ankle), Andrew Surman (calf). This means that Bournemouth are without their two recognised left-backs and means they will probably lineup as follows: Begovic, Smith, Ake, Mepham, Clyne, Lerma, Gosling, Brooks, Fraser, Wilson and King. Brighton striker Glenn Murray has gone over a month since he last scored in the win over one of his former clubs, Crystal Palace. Murray is still Brighton's top scorer, with 13 goals in all competitions only one short of the total he got in all of last season. He will be hoping to end his scoreless run against another one of his former clubs, Bournemouth. Murray will also be hoping to impress England manager, Gareth Southgate who could be without his potent striker Harry Kane for the next international break in June and Murray could be someone who is in contention.